1. Preheat the oven to 180 ̊C, gas mark 4. Grease and line the base of 2 x 20cm sandwich tins with parchment. Warm the cream, vanilla and 150g brown sugar in a pan, stirring until the sugar has melted, then heat until just steaming. Add the chocolate and stir until melted; set aside. 2. In a separate bowl, using electric beaters, cream the butter and remaining 150g sugar until light and fluffy. Beat in the eggs, a little at a time, until incorporated, then mix in the melted chocolate mixture. Sift in the flour, salt and bicarbonate of soda and beat to a smooth batter. Divide between the 2 tins and bake for 30 minutes or until a skewer inserted into the centre of the cakes comes out clean; cool in the tins on a wire rack. 3. For the buttercream, melt the chocolate in a microwave or a bowl set over a pan of barely simmering water; cool for 10 minutes. In a separate bowl, cream the butter and icing sugar for 2 minutes until smooth, then beat in the cocoa and a pinch of salt (optional). Stir through the cooled, melted chocolate; if the icing is too soft, chill for 10 minutes to firm. 4. Remove both cakes from the tins and peel away the parchment. Place one cake on a plate or cake stand and spread the top with a layer of icing. Sit the second cake on top and spread all over with the icing, covering both sponges. Scatter grated chocolate on top, if liked. 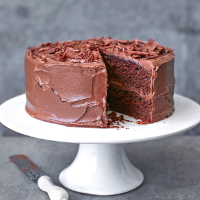 Blending white, milk and dark chocolate buttercreams with a palette knife creates this gorgeous graduated effect. For a simple but very effective decoration, pipe concentric circles in the middle and on the top layer of your cake. A hot trend for wedding cakes, spread a layer of white chocolate buttercream in the middle and on top, but keep it close at the sides.